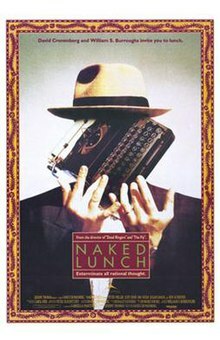 Naked Lunch. A 1991 drama film adapted from William S. Burroughs novel of the same name. Filmed mostly in Toronto Canada, this movie is taken from the real life experiences of William Burroughs and parts of the novel making it quite the interesting movie and leaves you wondering wtf? I first watched this movie back in 1995 when I was still young and impressionable and having read the novel prior to watching the movie itself, helped put it into perspective much quicker. Quick synopsis of the film? An exterminator finds out that his wife has been stealing his powder (pyrethrum) to get high from. He is arrested by the police and begins his own hallucinations due to “Bug Powder” esposure. He believes that he is a secret agent with two different handlers being a talking insectoid typewriter as well as an alien Mugwump who tasks him with killing Joan (his wife). 2.The Highlander. Another Phenomenal movie featuring Christopher Lambert and Sean Connery, set in 1985 New York, The immortal Connor MacLeod decapitates fellow immortal Iman Fasil in a parking garage. MacLeod’s past is revealed through numerous flashbacks in the Scottish Highlands around 1536. This is a great movie for those of us who love the middle ages and times. Filled with action, blood and romance, this movie is high on my list of “watch all the time” movies. 3. A Clockwork Orange. God bless Stanley Kubrick and this insane movie. I must have watched this movie hundreds of times during my late teens and early 20’s. Based in an England of the future, Alex and his Droogs spend their nights getting high before embarking on a “little of the old ultraviolence.” Singing in the rain is the song of choice for these mislead and seriously disturbed group which soon leads to Alex being jailed for bludgeoning the Cat Lady to death. His only way out is behaviour modification which makes him abhor violence. Released and defenseless, Alex is now the victim of his previous victims. If you’ve never seen it, there is no time like the present. 4. The Day the Earth Stood Still. I’m not nor have I ever been a huge Sci-fi movie buff but, this classic movie I first watched when I was about 12 and I remember it well. It is not the first sci-fi movie but it is most definitely one of the best. A humanoid creature and a robot arrive from space in peace and we humans for a change botch everything. This movie is in black and white so if you aren’t a fan of black and white, you may not find it appealing. 5. One Flew Over the Cukoo’s Nest. I had the pleasure of reading this and discussing the literary meaning of the book as well as watch the movie in grade 11. This is one of those movies that are spot on and totally aligned with the novel. I’m sure a big portion of you guys have watched this movie at some point or another. Perhaps its time to watch again or for the very first time! A classic tale of badboy gone wrong, institutionalized then when all else fails and he just doesn’t get it, the ultimate punishment. I’ll leave that for you to find out on your own though. That’s it guys, 5 of my all time favorites that I’m happy to be stranded on a deserted island with no doubt! What are some of your favourite movies of all time?